“Is it safe?” is a quote from one of my most favorite movies as a kid, “Marathon Man” starring Dustin Hoffman. There are two Central park running scenes in the movie (before and after Szell’s handy dental work.) 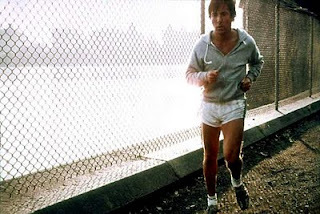 I was a teenager at the time and many years away from getting the “bug” to become a “Marathon Man” myself. One of the challenges of my training schedule is how to fit in runs when you travel—I’ve done the treadmill at 10PM, four miles the morning after a sales meeting (not recommended,) and early runs on the East Coast when my body is not quite awake. The “flipside” is that you often get to run in some really cool places. Hawaii, over the Golden Gate Bridge to Tiburon (a “bucket list” favorite of mine,) Toronto, and today I got to run in New York’s famous Central Park. I’ve got meetings in New Jersey this week and took advantage of being so close to one of the greatest cities in the world. Getting there by dusk was the challenge as I’ve seen too many movies showing what evils await in the park after dark. 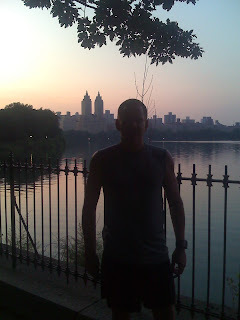 There’s a number of great sites including Run Your City that highlight where to run when you’re in another city—I found a number of routes in and around Central Park including the run around the reservoir made famous by Dustin Hoffman in Marathon Man. The park was bustling with runners, bikers, roller bladders and tourists at dusk. The 1.57 loop around the reservoir was awesome—recreating the Hoffman run, running a portion of the NYC Half Marathon, taking in the scenery, AND it’s a pebble path—great for legs that have been recuperating from injury. Overall, a great week; track work on Wednesday felt much better than “Weak One.” I hooked up with Runner’s Edge of the Rockies for my long run—out of Golden, Colorado with an “out and back” that ended at Lions Park next to Clear Creek. The reward was dipping your legs in the frigid creek that felt like a ice cold Jacuzzi—good stuff for aching legs. I tossed in a mile and half with my son who is trying out Cross Country in Jr. High—that probably beat out all the above.